VMI baseball will take part in two midweek games this week, traveling to Blacksburg on Tuesday to face Virginia Tech at 6 p.m.before playing host to the Old Dominion Monarchs Wednesday night, also at 6 p.m. Broadcasts of both games will be available.Tuesday night’s game can be viewed on WatchESPN through ACC Network Extra. A valid cable package must be held in order to watch the ACCNE feed on the web. In addition, Wednesday’s game will be shown on the SoCon Digital Network. 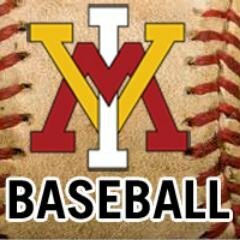 Live stats and occasional updates via the @VMIbaseco Twitter page will also be accessible. Tuesday night, the Keydets will be looking to beat Virginia Tech for the third consecutive time. The last time that happened? 1961-62, when the Keydets won three in a row from the Hokies. That 1962 season is also the last time VMI beat Virginia Tech twice in the same season. Third baseman Nathan Eaton saw his 31-game streak of reaching base end in Sunday’s loss to Mercer. It was the longest on record for a VMI player (stat kept since 2013). DH Collin Fleischer turned his season around in the recently concluded month of April, hitting .373 with eight homers, including two this past weekend at Mercer. Fleischer and OF Matt Dunlevy went back to back bothSaturday and Sunday. The Keydets have split their last four meetings with ODU. Following these midweek games, VMI is off for final exams until May 11, when the Keydets open a three-game set against Wofford at Gray-Minor Stadium.